For the Native American village, see Tuyunga, California. For other uses, see Tujunga (disambiguation). 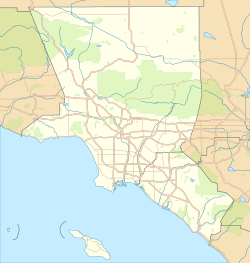 Sunland-Tujunga /təˈhʌŋɡə/ is a neighborhood in the San Fernando Valley region of the city of Los Angeles located by the foothills of the San Gabriel Mountains in the Crescenta Valley. Though Sunland and Tujunga began as separate settlements, they are today linked through a single police station, branch library, neighborhood council, chamber of commerce, City Council district, and high school and various civic organizations. The merging of these communities under a hyphenated name goes back as far as 1928. Sunland-Tujunga contains the highest point of the city, Mount Lukens. The neighborhood lies between the Verdugo Mountains and the San Gabriel Mountains. It is contiguous on the east with La Crescenta-Montrose. Sunland and Tujunga are divided by Mount Gleason Avenue, with Sunland on the west and Tujunga on the east. Mount Lukens within Tujunga is the highest point in Los Angeles at 5,074 ft (1,547 m). In 2019 there are still no signs of sidewalks or curbs in Tujunga, but by 1927 half of the streets had been paved. A state highway ran through the town. Streets within the Sunland and Tuna Canyon annex to Los Angeles were renamed in June 1929. The main east-west road, previously known as Michigan Avenue, became Foothill Boulevard. Other streets were renamed as follows: Los Angeles Street to Apperson Avenue, Sherman Street to Hartranft Avenue, Center Street to Grenoble Avenue, North Street to Wentworth Avenue, Third Street to Woodward Avenue and Hill Street to Hillrose Avenue. Sunset renamed to Commerce St. Manzanita Drive was renamed McGroarty Avenue in honor of John Steven McGroarty, who lived nearby. In the 1960s, the Sunland-Tujunga Chamber of Commerce took an active stand in opposition to routing the proposed Foothill Freeway through Shadow Hills, claiming the neighborhood's "rural atmosphere" would be destroyed and would wipe out 28 more homes than an alternate route. After years of discussion and delay, the final stretch of the 48.6-mile (78.2 km) freeway—through Sunland-Tujunga—was scheduled for dedication on April 3, 1981, with State Transportation Director Adriana Gianturco presiding. Exits in Sunland and Tujunga are, from west to east, at Sunland Boulevard, La Tuna Canyon Road and Lowell Avenue (shared with La Crescenta). The freeway's right-of-way almost completely bypasses the main part of the community, and runs along a viaduct in the Verdugo Mountains. Today, the neighborhood has one major thoroughfare: Foothill Boulevard. Nearly all businesses in Sunland-Tujunga are located on or near Foothill Boulevard. Tujunga Canyon Boulevard is a heavily travelled north-south route, but is primarily residential. Sunland Boulevard and Wentworth Street are popular surface streets which connect the community to Sun Valley and the rest of the city of Los Angeles. Sunland-Tujunga is also served by the Interstate 210 freeway. Big Tujunga Canyon Road connects Sunland-Tujunga to the Angeles Forest Highway, while La Tuna Canyon Road provides an alternate route into Sun Valley through the rugged portion of the Verdugo Mountains. Sunland-Tujunga has a hot-summer Mediterranean climate (Csa under the Köppen climate classification). Sunland and Tujunga were originally home to the Tongva people. In 1840 the area was part of the Rancho Tujunga Mexican land grant, but later developers marked off a plot of land known as the Tejunga Park, or the Tujunga Park, Tract. The name Tujunga is assumed to have meant "old woman's place" in the extinct Tongva language, where Tuhu "old woman" is a term for Mother Earth in Tongva mythology. Sunland began life as Monte Vista in 1885, when 2,200 acres (8.9 km2) of the Tejunga [sic] Park tract were divided into lots ranging from five to 40 acres (160,000 m2). One of the first uses of the new tract was the planting of 40 acres (160,000 m2) of olives, which made it the largest olive orchard in Los Angeles County. 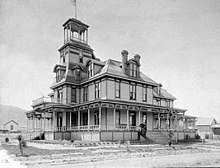 In 1887 the Monte Vista Hotel was being served by the Sunland Post Office. By 1906, the appellation Sunland was being used by the Los Angeles Times rather than Monte Vista. A 1907 story noted that Sunland was the "first supply store, and a good one, about seven miles from the railroad" at San Fernando, at the mouth of the Little Tejunga and Big Tejunga canyons (the old spelling). The place is aptly named.. . . one gets no inkling of the beauties till he is right in the town. Great live oaks, scattered with Nature's reckless disregard for expense, give the place a stately quiet.. . . In the center of town the oaks are so thick that the sun is baffled, and this section has been made a public park, which is the Fourth of July and general hot-weather rendezvous of the country round, from Glendale to San Fernando. By 1923, Sunland had a population of about 2,000 and an active chamber of commerce. The sloping hills of what was called the Monte Vista Valley were the site of vineyards for table grapes, and the town's sole industry, a cannery, specialized in packing olives from local trees. Monte Vista Park in the center of town attracted picnickers, and there was a County Home for Children, sponsored by women's clubs and other organizations. This charity was a descendant of the Monte Vista Lodge, a home for "undernourished children" organized by social worker Belle N. Hall and opened in 1921 by the Council of Community Service. It had 45 rooms in a former hotel on 2.5 acres (10,000 m2) of land. just a block from Sunland Park. After Tujunga was organized as a city in 1925, a move sprang up in Sunland to be annexed to the new municipality, but the idea was rejected "by a heavy vote" in October of that year, and activists in the then-Monte Vista School District turned their attention to a proposed $21,000 bond issue for a new school building. An early advertising slogan was "Move to Tujunga with a trowel and a bag of cement, and build your own." After the end of World War I, hundreds of "rent-oppressed" people from Los Angeles did exactly that, and they built their houses with foundations fashioned from the "great masses of stones and boulders" that lay throughout the town. For the most part, the "Indian pueblo idea" was followed, or a "rustic hills" style, and homes without boulder foundations were rare. By 1927 Tujunga had about 4,000 residents, having surpassed Sunland in population. Many of the settlers maintained small farms with gardens, poultry, rabbits, bees and various other livestock. Tujunga was home to John Steven McGroarty, playwright, U.S. congressman, and California Poet Laureate. He lived in a home he built himself and completed in 1923, known as Rancho Chupa Rosa. The building is an Historic Cultural Monument (#63) of the City of Los Angeles and is now known as the McGroarty Arts Center. On Tujunga's main street in the 1920s was a place called "Dean's store, the locale of the 'Millionaire's Club of Happiness and Contentment,' a little group of the town's pioneers which is featured in the writings of John Steven McGroarty". Tujungans led by McGroarty first wanted to become a city of the sixth class to be called "Verdugo Hills" in 1924, and a petition to that effect was submitted to the Board of Supervisors, which postponed the idea indefinitely because of concerns about the proposed boundaries. One of the first orders of business for the new city of Tujunga in 1925 was an attempt to enlarge the municipality by taking in the foothills south and southwest of the new city—bounded on the east by the "La Crescenta Rancho line, south to Big Tuna Canyon" and west to the then-Los Angeles boundary and Wicks Road. The attempt failed because Los Angeles annexed the area first. Tujunga's 1,500-foot (460 m) elevation and geographic isolation from the San Fernando Valley and the Los Angeles Basin freed it from some of the air pollution that was a problem in many other parts of Greater Los Angeles. Because of this, it attracted many asthmatics early on. In 1929, the Tujunga City Council set policy to establish zones where "sanitariums and other institutions for the care of tubercular patients" could be established. Most of today's Sunland was annexed to the city of Los Angeles, effective August 4, 1926. La Tuna Canyon was annexed in 1927. On June 23, 1927, the city of Los Angeles held an election for much of the same territory as claimed by Tujunga, above, and the annexation passed, "based largely on a big block of votes within an old-folks' home at Sunland which can participate in the Community Chest funds when and if they are within the city limits of the greater city". The result was a legal dispute that had to be settled in the courts. The famous grove of oak trees, owned by the county, and widely known as the Monte Vista Park of Sunland, is involved in the dispute. The municipality of Tujunga has already agreed to release its authority over the park to the county authorities, so that administration. . . will continue for ten years without change, except as to police protection in event of disorders. The first election for Tujunga to be consolidated with Los Angeles was held on February 15, 1927. In heavy rain, voters turned down the idea by a vote of 594 to 354. A second election held in March 1930 also resulted in defeat for annexation, "by a large majority". John Steven McGroarty was on a committee opposing annexation called "All for Tujunga". The third and final election in January 1932, however, resulted in a favorable vote to join Los Angeles, even though the actual transfer was delayed by inaction of state authorities. Tujunga finally gave up its independence and joined the city on March 8, 1932. 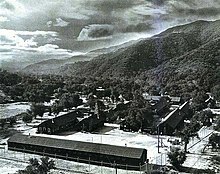 Tuna Canyon Detention Station was a temporary holding facility used for the internment of Japanese Americans during World War II in the Tujunga community of Los Angeles, California. Some Italian Americans, German Americans and Japanese Peruvians were also interned there. From this detention station, prisoners were later transferred to permanent internment camps. In 1959 a trial court held that the city had no authority to refuse a zoning variance to Consolidated Rock Company to continue operating a gravel pit in the Big Tujunga Wash, An appellate court overturned that decision, but in 1962 the California Supreme Court upheld the right of the city to ban the pit. The decision was a victory for local people who had battled the project for more than three years: They contended that the dust from the existing pit affected the area's reputation as a "haven for asthma sufferers". Attorney Peter R. Rice argued as a friend of the court that climate was more important than commercial mining operations. Los Angeles City Councilman Howard Finn of Sunland died in office on August 12, 1986, and his Northeast San Fernando Valley First District was left without an incumbent. At the same time, the City Council was under a court order to redistrict itself in order to provide more representation for Latinos. After a bitter contest in which Finn's semirural constituents fought against being combined with more built-up areas and amid traces of ethnic animosity, the result was to move the vacant First District seat into a redrawn, 69-percent Latino area north and west of Downtown Los Angeles and to place Sunland-Tujunga into a reshaped Second Council District, already represented by Joel Wachs. It was a Y-shaped configuration "with only a long, thin finger of territory" connecting Sunland-Tujunga on the north with Van Nuys on the south. A lawsuit against the plan was dismissed in late September by U.S. District Judge James M. Ideman. There hasn't been one nasty person, one hostile. . . They want to be friends.. . . In the second largest city in the U.S., that you can have an area like this to live in is just fantastic. Wherever I've gone, preserving the life style seems to be the No. 1 issue. Wachs served on the council for 15 more years. He resigned effective 2001, and a city redistricting commission took the opportunity to propose a shakeup in boundaries, splitting the Second District in two. Before that could be considered, though, Wendy Greuel was elected to the City Council. In March 2002 she reopened the Sunland-Tujunga field office (closed by Wachs), and the redistricting plan was never heard of again. Greuel served until July 2009. She was succeeded by Paul Krekorian. In January 2009, hardware company Home Depot announced it was giving up a five-year effort to turn a former Kmart store at the corner of Foothill Boulevard and Woodward Avenue, Tujunga, into a big-box store of its own. Opponents also mobilized hundreds of people to turn out for meetings on the project, including a marathon seven-hour session that turned into a shouting match over day laborers and immigration. Home Depot, in turn, had retained a team of expensive lobbyists who arranged for buses to transport supporters to meetings at City Hall. In 2006, one of those lobbyists sent a memo promising to feed and transport 150 people in orange T-shirts to a City Council hearing where they would appear in favor of Home Depot—at a cost of $24,000 to the company. The City Council determined that the extent of construction involved exceeded the limits of what is known as "tenant improvements" and thus qualified as a "Project" subject to the CEQA (California Environmental Quality Act). Under CEQA rules, Home Depot would be required to carry out an environmental impact report, so the company filed a lawsuit against Council Member Wendy Greuel, accusing her of improperly interfering with the process. The company paid $2 million to lobbying firms on behalf of the project. For years, the Big Tujunga Wash has provided a picturesque backdrop for local residents who enjoy the rare natural river bed that's perfect for hiking, jogging or collecting butterflies. Also, the new Angeles National Golf Club is right in the middle of the wash. But, residents say there's trouble brewing in Big Tujunga. Homeless camps are big concerns for residents, who say they sympathize with the homeless but say they drag in too much trash. The cleanup -- and summary eviction of as many as a hundred squatters -- on 300 acres of private land a little more than a mile upstream from Hansen Dam was organized and financed by property owners of the Riverwood community of Sunland, a hillside enclave of about 35 homes whose residents come and go on a single road crossing the wash. Over the last three years, the growth of the shanty village has despoiled a public resource and subjected homes along Oro Vista Avenue to burglaries and the threat of violence, said Brian Schneider, who spoke for the residents. In 2009, the Los Angeles Times's "Mapping L.A." project supplied these neighborhood statistics based on the 2000 census, showing that Sunland, including Shadow Hills, had a census-measured population of 28,414 in 2000. Tujunga was slightly smaller, at 26,527. In both Sunland and Tujunga, the percentage of white people was high for the county. The percentages of divorced males, married females and divorced females were among the county's highest. (Without Shadow Hills) Population: 15,316. Median household income: $68,720, high for the city of Los Angeles but about average for the county. The percentages of residents 25 and older with a high-school diploma and some college education were high for the county. Population: 13,098. It was a moderately diverse neighborhood. The area had a high family income. The median age at 39 was old for both the county and the city. The percentages of veterans who served during World War II or Korea and Vietnam were among the county's highest. Population: 26,527. Median household income: $58,001. The percentages of residents 25 and older with a high school diploma and some college education were high for the county. The median age was 36, old for the city of Los Angeles but about average for the county. The percentage of residents ages 35 to 49 was among the county's highest. 9.7 percent of the population were veterans, high for the city of Los Angeles but about average for the county overall. The percentage of Vietnam veterans was among the county's highest. Sunland-Tujunga's reputation has changed over the years. In the 1950s through the 1970s, the area was known as a "haven for asthma sufferers" and that it was "long noted for the beneficial qualities of its pure air" and had a "reputation as a health resort" or a "reputation for clean mountain air". Tujunga was seen as having a "near-Switzerland setting – high and dry". In 1957 Coronet magazine called Tujunga "the most healthy place in the world," and that publicity brought a flood of inquiries into the office of the Sunland-Tujunga Chamber of Commerce, hundreds a month. In 1963 the area was seen as "famous for its climate beneficial to asthma sufferers". The word "Tujunga" in the native Tongva language means "the old woman", in reference to the concept of a nurturing "mother nature". No one really knows why so many long-haired, bearded young men on motorcycles, aligned in groups with names like "The Devil's Henchmen," chose to hang out in this workingman's community perched on the southwest slopes of the San Gabriel Mountains a half dozen miles north of downtown Glendale. But hang out they did, in droves, and Tujunga developed an unenviable reputation as one of Southern California's premier "biker towns". Police say the bad-apple bikers bring a particular set of problems, mainly the use and sale of speed [ methamphetamine ]. Tujunga's reputation for meth peaked in the 1990s, and the LAPD singled out the area in 1994 as the speed capital of the Valley. Users cruising for a fix were a common sight on some of the narrow side streets off Tujunga Canyon Boulevard. Police say the meth scene, though still active in Tujunga, is no longer the problem it was, thanks to block-by-block community policing efforts and the town's relative gentrification. Even Marlene Hitt, the community's newly appointed poet laureate, said in 2001 that she got the job in part to counter Sunland-Tujunga's image as a home to drug dealers. Twenty-two percent of Sunland and Tujunga residents aged 25 and older had earned a four-year degree by 2000, an average percentage for the city and the county. In its early years, Sunland had its own school district—called Monte Vista—and Tujunga was also served by its own district. In March 1926, Tujunga voters approved a bond issue for a 20-acre (81,000 m2) high school site. By 1927 Tujunga had two schools built in "quaint Spanish style" for 400 pupils. On January 8, 1929, the county Board of Supervisors approved a petition drafted by Tujungans to join the Los Angeles School District (LAUSD). A 1966 plan to require students of the equestrian community of Shadow Hills to switch from the overcrowded and virtually all-white Mount Gleason Junior High School in Sunland to the more diversified Maclay Junior High in Pacoima was opposed by the Shadow Hills Homeowners Association. A charge of de facto segregation was made by Los Angeles Valley College instructor John Buchanan, who lived in Pacoima, and by the Sunland-Tujunga Human Relations Council, whose president, Paul Tsuneishi, said overcrowding at Mt. Gleason resulted in classes being held on an auditorium stage, a corrective physical education room and a multipurpose room. Shadow Hills, midway between the two schools, was an optional attendance area for either school, and 215 of its children were attending Mount Gleason, versus just 22 at Maclay. One African-American was among the 2,030 students enrolled at Mount Gleason, while 25 percent of the 1,200 students at Maclay were African-American and 27 percent were Mexican-American. Glenn Haschenburger, president of the homeowners' association, denied the charge, stating that "We were not even aware of the racial composition at Maclay." He added that students were not taking a school bus to Maclay because "We believe riding and caring for horses is part of producing good citizens. They can't ride horses if they spend all their time riding buses to and from school." Nearly 200 persons who filled the board meeting room greeted the action with boos and catcalls, "My child will never go to Maclay!" and "The Communists started to take over in 1928!" On September 19, 1966, a procession of about 40 cars followed a hearse from the edge of Shadow Hills to Mount Gleason Junior High, parents paraded with picket signs and leaders "removed a model red schoolhouse from the hearse and laid it in front of a mock headstone" as a eulogy to the concept of the neighborhood school. A lengthening shadow hovers across the sunny, foothill community of Shadow Hills, the shadow of racial tension.. . . a pervasive bitterness has spread through the quiet neighborhood. . . Neighbor is set against neighbor ;. . . old friendships have dissolved.. . . Even churches and youth groups, the Boy and Girl Scouts, have been splintered by bitterness. Root of the discord is the dispute over which junior high school Shadow Hills children should attend. The Times article was attacked by Edward L. Fike, editor and publisher of the Record-Ledger newspaper of Sunland-Tujunga, who wrote that "The suspicion grows and grows that the Board of Education by a one-vote margin knowingly sacrificed the Shadow Hills neighborhood upon the altar of forced integration as demanded by agitators and by the U. S. government as its price for federal aid." Mrs. Edna Susank, principal of Mt. Gleason Junior High in Sunland, said that discussions with parents when a false address is discovered reveals an adamant attitude, sometimes with table thumping, that they will not send their child to an inferior school. Sunland-Tujunga residents were foremost in a fight against mandatory busing for the purpose of school desegregation in Los Angeles. On January 21, 1977, an estimated 4,000 students—about half the total enrollment—stayed away from classes at nine Sunland-Tujunga schools as parents, led by Samm Ferris of Sunland, staged a one-day boycott to protest any idea of mandatory busing. About 35 "concerned mothers" picketed three elementary schools as well as Mount Gleason Junior High and Verdugo Hills High schools. In May of the same year, Donna Kent of Sunland-Tujunga became president of the local chapter of Bustop, a citywide group opposed to the busing program. She said her chapter managed to raise $1,000 of the $5,000 needed monthly for lawyers, by holding raffles, rummage sales and Tupperware parties. In August 1980, as the school district was making plans to bus some students from Sunland Elementary School to Pacoima, about 100 parents met at the school to protest. Parent Betty Reeve said she and others had organized a "Yellow Flu" campaign to keep students away from school and show that "our kids are sick of riding a yellow school bus." Nevertheless, a busing procedure resulted in white elementary students from Apperson Street, Sunland, Plainview Avenue and Mountain View elementary schools in Sunland-Tujunga being exchanged with minority counterparts in Lake View Terrace, Sun Valley and North Hollywood. Mount Gleason Junior High and Verdugo Hills High schools did not take part. Mandatory busing was ended by a decision of the California Supreme Court on March 12, 1981, and when the practice was finally stopped the next month, most of the Sunland-Tujunga pupils returned to their neighborhood schools, but most of the previously enrolled minority students continued to be bused into Sunland-Tujunga on a voluntary basis. By February 2010 Mount Gleason Middle School had been on a federal list of under-performing campuses for 12 years, and a group of parents organized to take advantage of a new state law in an attempt to force administrative changes. The law, dubbed the "parent trigger", could compel districts to take drastic action to fix failing schools if a majority of parents petitioned for an overhaul. In an interview, four parents told CNN in October 2010 that Mount Gleason was unsafe and they wanted the principal ousted. An official of the Los Angeles Unified School District messaged CNN that the school had followed proper procedures and had taken "corrective action". The Los Angeles Police Department's Foothill Community Police Station in Pacoima serves Sunland and Tujunga. Los Angeles Fire Department operates two stations: Station 24 in Sunland and Station 74 in Tujunga. The Los Angeles County Department of Health Services operates the Glendale Health Center in Glendale, serving Sunland-Tujunga. The Los Angeles Public Library operates the Sunland-Tujunga branch in Tujunga. Sunland Park was originally known as Monte Vista Park. The Haines Canyon Park in Tujunga is an undeveloped park used for brush clearance. It is open to visitors from dawn to dusk; however, the Los Angeles Park Department said that it does not recommend the park for public use. The Sunland Recreation Center serves as a police department stop-in center. It has a 250-seat gymnasium that is also used as an auditorium. In addition the facility has a lighted baseball diamond, lighted outdoor basketball courts, a children's play area, a community room, a lighted athletic field, picnic tables and tennis courts. Annual events there include the Easter Carnival and the Watermelon Carnival in mid-August. In addition, the Verdugo Mountain Park is east of central Sunland and south of La Tuna Canyon Road. Howard Finn Park, named after the City Council member who died in 1986, is a 2-acre (8,100 m2) park opened in late 1990 behind the Sunland-Tujunga Municipal Building. Fehlhaber-Houk park was built at the northwest corner of Tujunga Canyon Boulevard and Elmhurst Drive on a 1.2-acre (4,900 m2) vacant lot donated by brother and sister J.L. Houk and Elizabeth Swanson in 1975. The parcel had been part of a 58-acre (230,000 m2) ranch owned by Raymond and Irene Fehlhaber. Fifth Los Angeles County Supervisorial District, represented by Kathryn Barger of San Marino. Los Angeles City Council District 7, represented by Monica Rodriguez of San Fernando. The Sunland-Tujunga area is served by the newspapers the Voice, the Foothill Record, the North Valley Reporter, and the Crescenta Valley Weekly. Bolton Hall is a historic American Craftsman era stone building in Tujunga. Built in 1913, it was originally used as a community center for the Utopian community of Los Terrenitos. From 1920 until 1957, it was used as an American Legion hall, the San Fernando Valley's second public library, Tujunga City Hall and a jail. In 1957, the building was closed. For more than 20 years, Bolton Hall remained vacant and was the subject of debates over demolition and restoration. Since 1980, it has been operated by the Little Landers Historical Society as a local history museum containing artifacts, photographs, documents, the old clock from the first Tujunga Post Office and memorabilia of Sunland-Tujunga and the foothill area. McGroarty Arts Center is Historic Cultural Monument No. 63 of the City of Los Angeles. It was built in 1923 by John McGroarty, poet, Los Angeles Times columnist, and author who served two terms as a Democratic congressman from California. The building now offers instruction in art, music and performance, exhibitions, and hosts cultural events. E.T. the Extra-Terrestrial was filmed in some parts of Tujunga, including the house that Elliot lived in. Portions of Corvette Summer starring Mark Hamill were filmed at Verdugo Hills High School. In the past, Ben-Hur raced his chariot in Big Tujunga Canyon and Lancaster Lake (now long since gone) adjacent to Sunland Park was home to Tarzanwhich? in the jungle hunk's first silver screen epics. All The King's Menwhich?, Mildred Pierce, The Birth of a Nation, Meet John Doe, The Craft, Ernest Goes to Camp, and River's Edge (1986, with Keanu Reeves) are a few of the numerous films shot in Sunland-Tujunga. Also, Teen Wolf and Sons of Anarchy. The Travel Inn, located on Foothill Blvd in Tujunga, is one of the filming locations for both Seven Pounds and Memento. CHiP´s episode of Season 5 (1981) was filmed at Foothill Blvd & Mather Avenue intersection. Sonia Greene Davis (1883-1972). Journalist and businesswoman. 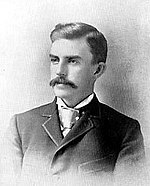 Alvah Curtis Roebuck, co-founder of Sears. ^ "Mount Lukens". Sierra Club Hundred Peaks Section. ^ "U.S. Geological Survey Publications Warehouse". ^ "Tujunga, California". Intellicast. Retrieved September 6, 2015. ^ Sarah R. Lombard, Rancho Tujunga: A History of Sunland-Tujunga, California, Sunland Woman's Club, 1990. ^ a b c "Annexation Map City of Los Angeles" (PDF). navigatela.lacity.org. Retrieved August 26, 2015. ^ "Sunland-Tujunga residents fight trash vandals". ^ "Family Of Woman Found Dead In Wash Host Cleanup Event At Site Her Body Was Found". ^ "Mapping L.A. - Los Angeles Times". ^ "List of LAPL branches. ^ "Sunland Recreation Center." City of Los Angeles. Retrieved on March 19, 2010. ^ "California's 28th Congressional District - Representatives & District Map". Civic Impulse, LLC. ^ a b "Statewide Database". UC Regents. Retrieved December 10, 2014. ^ "The City of Los Angeles : Council District 2 : DISTRICT 2". Archived from the original on May 4, 2010. Retrieved August 26, 2015. ^ "The Voice | Good news coverage for a great community - The Foothills, Sunland-Tujunga, Shadow Hills". voiceofthevillage.org. Retrieved August 26, 2015. ^ "The Foothill Record / Our Community News Source". ^ "North Valley Reporter". northvalleyreporter.com. Retrieved August 26, 2015. ^ "Crescenta Valley Weekly | The Foothills Community Newspaper". cvweekly.com. Retrieved August 26, 2015. ^ Hitt, Marlene A; Society, Little Landers Historical (2002). Sunland and Tujunga. ISBN 9780738523774. ^ "Sons of Anarchy" Season 4 DVD Commentary, Disc 3, Episode 413. ^ "IMDb: Most Popular Titles With Location Matching "Travel Inn - 7254 Foothill Blvd., Tujunga, Los Angeles, California, USA"". IMDb. Retrieved December 13, 2016. ^ Brian Mathieson (March 15, 1999). "Obituary: David Ackles". Arts and Entertainment. The Independent. London: independent.co.uk. Retrieved August 26, 2015. ^ Baisley, Sarah. "LAPD & SWAT Surround Voice Actor Burson". AWN. AWN. Retrieved October 1, 2012. ^ "GREG BURSON ARRESTED". Retrieved July 21, 2015. ^ James P. Cannon, The Struggle for a Proletarian Party. New York: Pioneer Publishers, 1943; page 54. ^ "The Lancer". Los Angeles Times. January 11, 1936. p. A-1. Retrieved August 26, 2015. ^ "Saralyn R. Daly | Directory of Writers | Poets & Writers". Pw.org. August 20, 2008. ^ "The Adventures Of A Street Musician Part 1 | Mickey Zekley, 'The Hog Farm Blues'". larkcamp.com. Retrieved August 26, 2015. ^ Hatcher, Teri (2006). Burnt Toast and Other Philosophies of Life. London, U.K.: HarperCollins. p. 38. ISBN 978-0-00-722935-2. OCLC 156320712. When I was working on Lois & Clark, I lived in Sunland, a horse community in the northeastern valley of LA that gave me the down-home rooted feeling I was looking for to counteract the glamour and stress of Hollywood. ^ "The Mountain Enterprise". mountainenterprise.com. May 22, 2009. Retrieved August 26, 2015. ^ "Los Angeles Public Library reference file" (PDF). dbase1.lapl.org. Retrieved August 26, 2015. ^ "Bullwinkle Speaks! An Interview With Bill Scott | Hogan's Alley". cartoonician.com. Retrieved August 26, 2015. ^ "A Close- Up Look At People Who Matter : A Resident of Memory Lane, Tujunga 91042". Los Angeles Times. ^ Website Design by SetMySite.com. "Archives - Voice of the Village - Sunland Tujunga Shadow Hills". Voice of the Village. ^ Gazzar, Brenda (December 1, 2013). "'Fast & Furious' star Paul Walker remembered as kind, carefree". Los Angeles Daily News. Retrieved December 3, 2013. ^ "Randy Bobb - BR Bullpen". baseball-reference.com. Retrieved August 26, 2015. ^ Bodfield, Rhonda (October 15, 2010). "Pueblo Politics: Did governor graduate from high school?". Arizona Daily Star. ^ "Bob James Statistics and History | Baseball-Reference.com". baseball-reference.com. Retrieved August 26, 2015. ^ "McKEON, Howard P. (Buck) - Biographical Information". bioguide.congress.gov. Retrieved August 26, 2015. ^ Ovington, Reg (August 22, 1954). "TV is Banking on Jaye P. Morgan". Reading Eagle. Retrieved March 16, 2013. ^ a b "VHHS Stars: John Purdell | Profile from Verdugo Hills High School". lausd.k12.ca.us. Retrieved August 26, 2015.